JuliaBobbin: Pattern Parcel #6 - The Julia Cardigan ... and a bump! Pattern Parcel #6 - The Julia Cardigan ... and a bump! 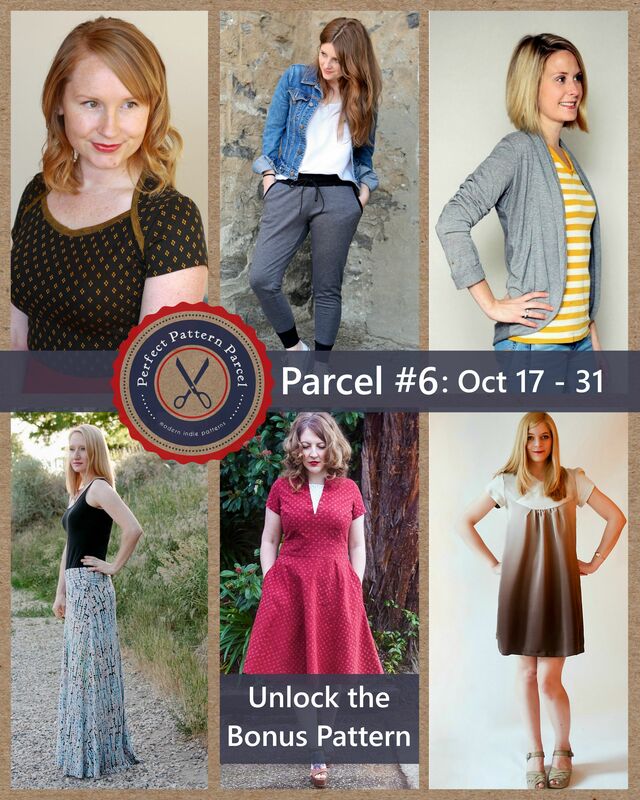 Ladies and Gents it's pattern parcel #6 time! This is my first use of 'Perfect Pattern Parcel' and once I heard what it was all about I HAD to get involved! "Here at Perfect Pattern Parcel it is our mission is to offer high-quality pdf sewing patterns written by independent designers while supporting charity. We go about this in a unique way, by allowing the customers to choose their own price in supporting the designers included in the Parcel. In addition to determining the total sales price, each customer purchasing the Parcel is able to allocate how much of their price goes to the designers, the company, and to the charity, DonorsChoose.org. As a company we cover the costs of web hosting, design and payment processing fees from our allocated position, then we donate our remaining earnings to the charity as well. " So not only does this support independent pattern designers, it also raises money for a charity called Donor's Choose which helps students in need. So far Pattern Parcel has raised over $13,000! Amen to that! There are five awesome PDF patterns in this parcel, and you get to choose how much you want to spend, including the portion that goes to the designers and the portion that goes to charity. If you spend over $32USD you also unlock the sixth PDF pattern the 'Odette Dress' with your parcel. You'll need to be quick as the parcel is only available until October 31st, 2014. Out of the pattern parcel I chose to make the Julia Cardigan, because HOW COULD I NOT MAKE SOMETHING THAT SHARES MY NAME!?!!! This is a pattern made for knit fabrics and it is versatile with three different sleeve lengths. 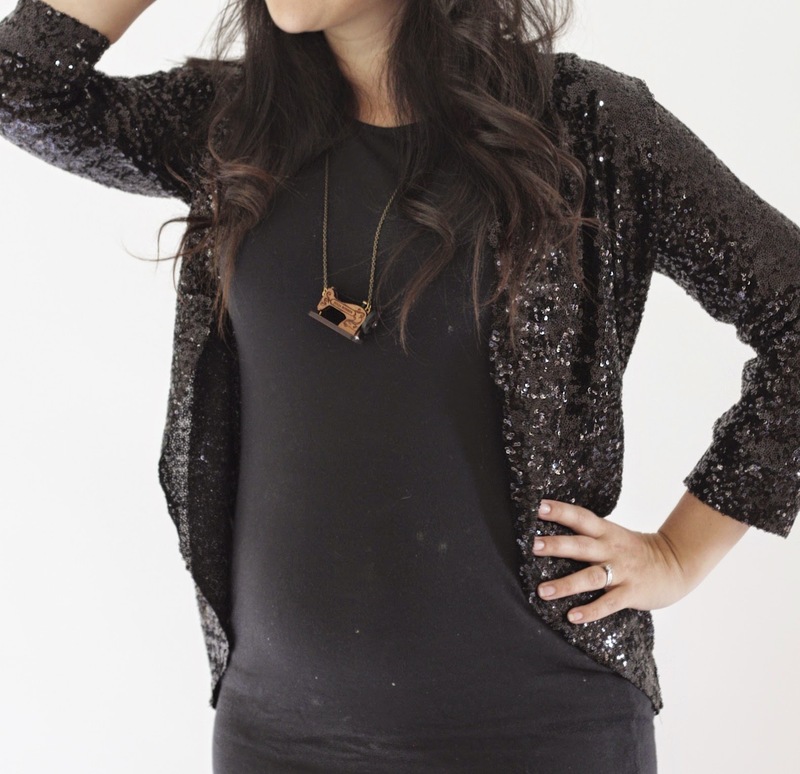 I chose to make this cardigan with stretch sequins because: sparkly. This pattern looks fabulous in a regular knit fabric. But if I'm going to make my name sake, I need to OVER INDULGE the HECK out of it! And sequins make me happy. Actually no, WEARING sequins makes me happy, sewing with them makes me HOMICIDAL. Oh and did I mention it was my first time sewing with these carpet leeches? Tip; don't sew them over carpet. Or inside the house for that matter. Luckily I had a STUH-nning sequinned fabric to work with from Tessuti Fabrics. This fabric actually made the sewing process a zillion times easier because I didn't unpick any sequins from the seam allowance (gasp!) and just went nuts. That is the difference between good quality and bad quality fabrics (and a reckless seamstress). I made it in a small size, as I like my cardigans to fit closer to the body, seeing as there are no closures down the front. It was a quick and easy pattern to make, even with the sequins and a very satisfying result. The instructions are fantastic and I love how my sparkly cardigan turned out! Yay for Pattern Parcels! I got my own little human parcel in the works. Yes that's right, I'm pregnant with baby bobbin number TWO! Which pattern do you want to make out of the parcel? Fun!! Congrats on bubba bobbin and your sequin sewing success (you're with me on the alliteration right?!) The big question from me is...where the heck did you get your AWESOME necklace?!? YES! :) Thanks Nat, we are super excited. How good is the necklace right? I purchased it a while back on etsy from a store called 'StrangelyYours'. You even get to customise the writing on the sewing machine. Mine says 'Julia Bobbin'. Awesome! Horray to it all: the sparkles, the cardi and the baby. You always look glowing, but perhaps now more so? Oh you are too wonderful. Thank you! 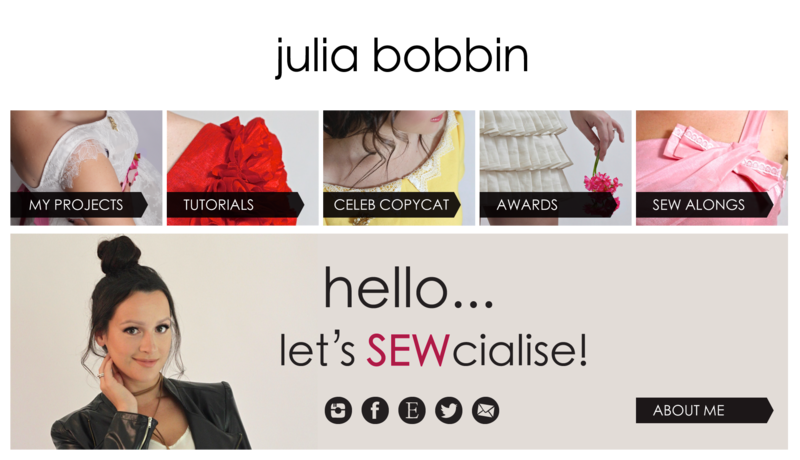 Looking forward to catching up with you gals soon at social sewing! Congrats on the pregnancy! Love the cardi too. Congrats to all the fam on baby Bobbin 2! You are looking as lovely as ever and how clever to use sequins and take this pattern to a whole new level of ace!? Thanks Lisa! It's fun to use an unexpected fabric for a pattern, and sequins just make everything seem so lux! Yay miss! Congratulations. May there be a constant supply of fun in your household! Thank you! Oh the fun is definitely here to stay now! One: I'm gonna copy that cardigan and Two: Yay more babies! Mine are 13 and 11 now and 22 months apart. So far our plan to make sure they are each other's best friend and cheerleader is working out. You can never have too many bobbins! Congratulations; more happy times await. Congratulations! You look gorgeous in the sequins and I can imagine you'll have plenty of places to wear it over the holidays. Thank Sara, I hope so! I love that it's a garment that I can wear both pregnant and after baby. Win! CONGRATS JULIA! So happy for the Bobbin clan. Thank you lovely Heather Lou! Another baby that I can force, I mean encourage to love sewing! Congratulations Julia! Lovely to see you looking so radiant! Thank you Sylvie! We are very excited! Congratulations on Baby Number 2. You look radiant and that is ine awesome cardi. Sparkles rock! I am such a sucker for sparkles. It was only a matter of time before I made something out of sequins! Yay, congratulations! What great news!!! And love the sequins! Congratulations to a very sparkly Mummy! Yes baby number two is a little bit more of an achievement :) Thanks Sabine! Congratulations on baby number two!!! Thank you! We are very excited. Time is already flying! oh yes I did! The sequins were begging to be sewn! :) Haha, thank madam. So glad you like it! Congrats on baby number two! And the sparkles are fabulous. Love it. Congratulations! And the cardigan is so lovely. Congrats! And the cardi is lovely. I had seen a sequined one once before and now definately want to make myself one, it's gorgeous! Great idea making a sequin version - brings such glamour! Many congrats too. Congratulations Miss Julia! I love it when my blogger friends are pregnant. Then I get to see all the absolutely adorable bump pictures! I'm totally torn between wanting to scream "OOOOHHHH SPARKLY!!" and "BABIES!!!!!!!!" This isn't unusual for me. Congratulations!!! I'm so happy for your little expanding family!! 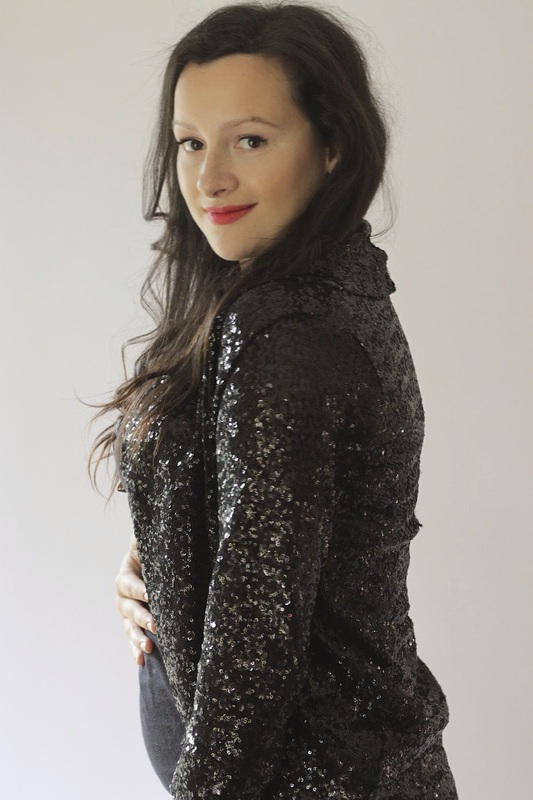 And you have to be the most divinely glamorous expecting mama I've ever laid eyes on in your epic sequined cardigan!! Congrats Jualia on your new little bobbin! You look amazing with your whittle bump. Love the sequin cardi I ♥ sequin they are so much fun! Regarding the 13K raised by this PPP-- Is that all going to the charity? Lovely spakly cardi and more importantly congrats on the pregnancy! Great cardi. I would have never thought to make a stretch garment out of sparkles. Thanks for the inspiration. Awesome job! Congratulations on the baby parcel! Aha! The bump is out of the bag! Love the sequins, love the bump, love you! Julia- this is freaking rad news! Congrats! And your cardi is freaking rad- so sparkly! Congratulations! And yay for sewing with sequins and live to tell the tale! Congrats on the bump and the cardigan. You've given me an idea for some weird black lurex knit I bought in a country fabric store out of pity. She was on the verge of closing down so I bought a whole stack of thread and 2 metres of 'weird' fabric. Awwww Congratulations! 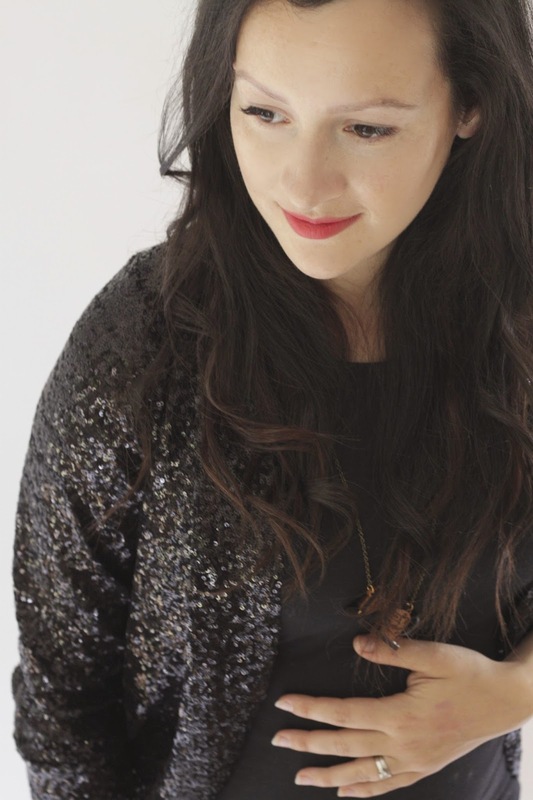 And such a lovely sparkly cardigan, it's like a party you can wear. Congrats! You look wonderful! I missed this pattern parcel...boo on me for that. It was a great selection! Dear Julia. I miss hearing from you. Hope you're allright. Great outfit, you look great. Thanks for sharing.